Flowers au naturel (according to nature, in a natural state, not artificial) are my first choice for flowers in my French-inspired garden and home, but sometimes real French country flowers are not possible. The sight of foxgloves growing abundantly and luxuriously throughout the Burgundy region in the center of France makes me want to grow foxgloves in my garden in north Texas. After each trip to France I rush home with grand plans to grow lush flower gardens. Grand plans to plant foxgloves that will say, "Bonjour." Welcome to my home. 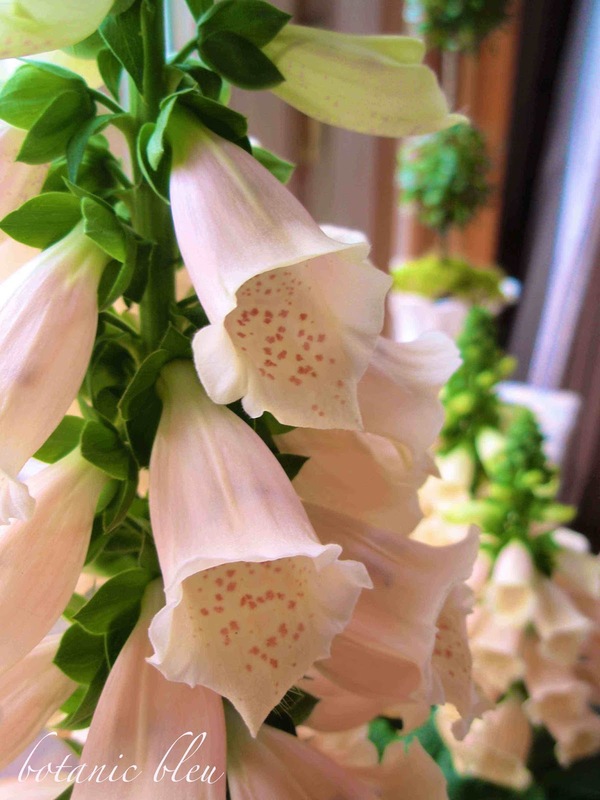 Plans to plant soft peach foxgloves with deep rosy speckled throats and ruffled edges like ones found at a local store one spring and shared at Spring Peach Foxgloves. Then I step outside the doors of the airport and am met with a wall of hot air so thick I can hardly breathe. The only foxgloves to welcome guests to my home will be ones treated as annuals in a pot or artificial ones. Undaunted, I fill my entry way with a purple pot of faux foxgloves. Pale yellow faux hydrangeas in a large bird's nest atop an old pale blue B O N J O U R bucket sit on the vintage chippy wooden chair in my front entry and add to the feeling of a natural setting. Living foxgloves may not thrive in the north Texas heat, but my entry still gives a French bonjour with its rustic metal bucket, artificial foxgloves, and a gold and blue beribboned French-style mirror. Seen from a distance standing in the kitchen, the pot of foxgloves is hard to distinguish from a pot of live plants. 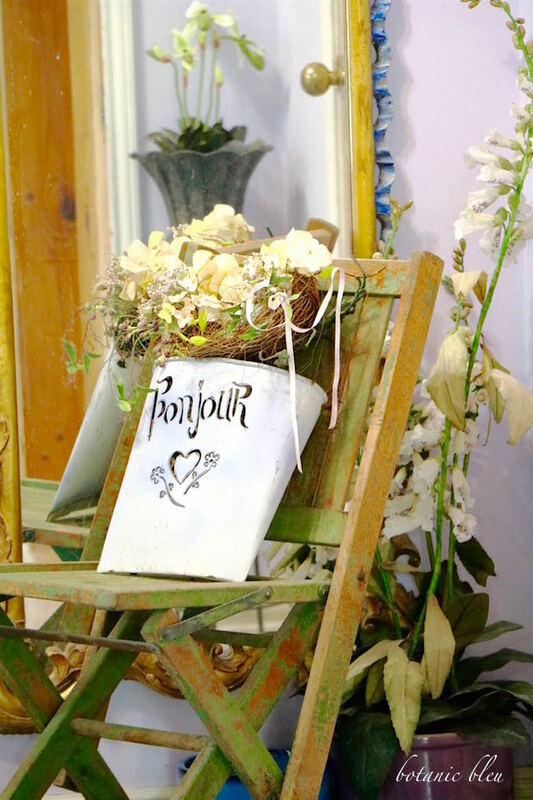 As I recently read, French Country style is making the best of life with elegance. No foxgloves in my garden? Not a problem. 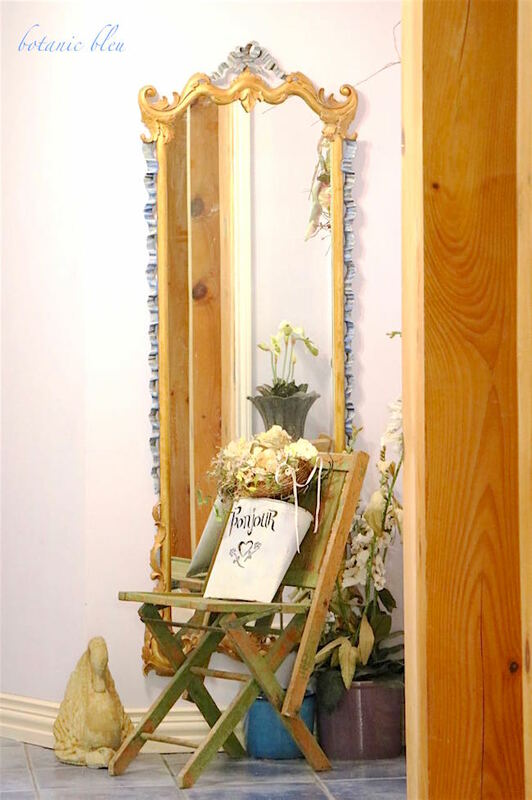 Make the best of it with artificial ones paired with an elegant French-style mirror. Does your garden have foxgloves? Oh, you lucky gardner! I absolutely have no problem with silk flowers and I think your arrangement is lovely. Very warm and welcoming! 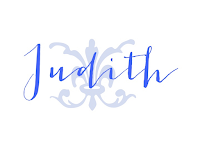 Judith, your home always reflects the grace and elegance of French Country style. I know you live with beauty all around. I love this display simply beautiful. back in the day during my floral career I enjoyed the use of silk, parchment and dried flowers to create an elegant space. This entry reminded me of that. Very well done. 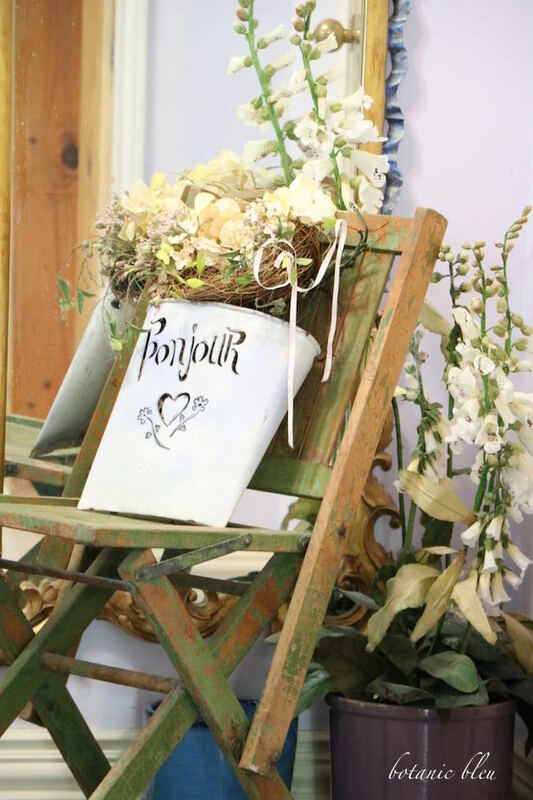 Your French inspired entry is lovely. Your faux foxgloves would have fooled me. Foxglove is a flower I never could grow , guess because of my soil or location where I planted them ? wonderful ideas in this post. gave me the inspiration to redo my front door. Unfortunately, foxglove will not grow here either. Even in pots, it's so dry they don't last long. 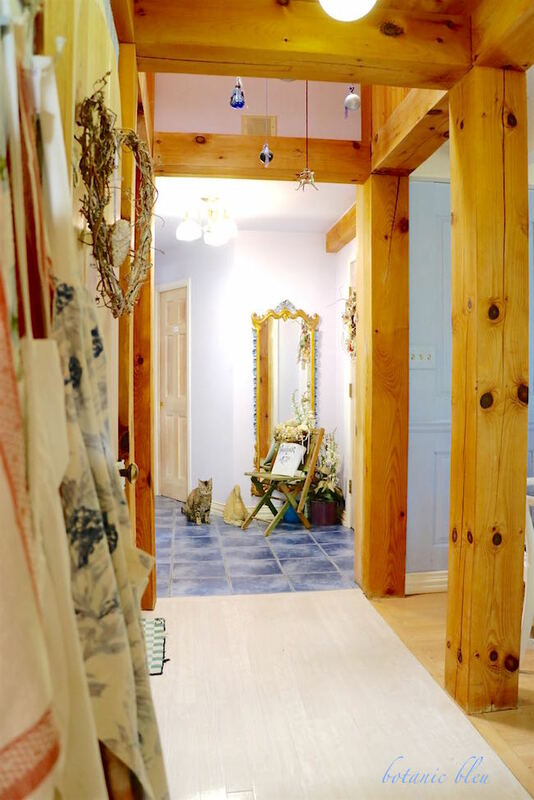 I do love they way the artificial ones look in your foyer, so maybe a trip to the craft store is the answer! As always, a beautiful post and photos!